We apologize for the delay in the Lakeview News, but there are two important items we wanted to share with you about our new turf field and October Parent-Teacher conference sign-up process that had to wait until today (see below for those updates). Again, we want the Lakeview News to show the joy and learning that happens every day at Lakeview. You can access archives for the PTSA-produced Leopard Tales newsletter, as well as view an archive of both the Leopard Tales and the Lakeview News, at the links below. We are excited to meet with you and your student at our upcoming parent-teacher-student Goal Setting Conferences on Oct 12-15! We are using a website called Sign-Up Genius to streamline our sign-up process this year. If you need assistance in completing the sign-up process or do not have internet access (you can complete the sign-up process on most internet-connected smartphones and tablets) we will be holding a drop-in support session in the main office at Lakeview on Tuesday, September 29th from 3:30-5:00pm. We are only able to provide one 20-minute conference per student. If your student receives Special Education, Safety Net, or ELL services, sign up for the matching time slot on the SpEd, Safety Net, or ELL tabs. Remember that school ends at 12pm on October 12, 13, and 15th for conferences. Busses will run at 12:10pm on those days and students who receive free- and reduced-lunch will receive a bag lunch before heading home on those days. We are excited to have the opportunity to meet with you soon! We are delighted to announce a ribbon cutting ceremony on Thursday, October 8th at 3:45pm. This brief ceremony will be an opportunity to hear from our district and city leadership and say thank you to Google for their generous support of Kirkland City and LWSD. We hope you and your family can attend. We will be closing the lower lot to save parking for our district and city visitors, so please make an adjustment to your drop off and pick up for the afternoon of October 8th. Also, the local media will be present, so expect to have your image taken if you choose to attend. We hope to see you there! Kelson, Andrew, Claire, and Riah working together on sequencing during ELA in Ms. Brown-Tiffany's class. Rhea and Riah, Little Buddies from Ms. Brown-Tiffany and Ms. Gahnberg's class. Kindergarteners in Ms. La Pointe's class. Our 5th graders listen to Ms. Ben-Menachem, our school counselor, about bucket fillers and being the positive leaders at Lakeview. Last week was Walk-to-School Week, Mr. Thatcher dressed up as Pedestrian Bee to greet students on Monday morning. This week you will be receiving SBA score reports in the mail for students who completed SBA testing last spring. Third through fifth grade students took the SBA assessment, so it will be this year's fourth and fifth grade families who will receive reports (last year's fifth graders, who are now in middle school, will receive their reports from the middle school). We have prepared a brief presentation that explains the score reports. There is both a narrative Powerpoint version as well as a video version, they contain the same information. Parents are welcome and encouraged to visit school. Classroom visits need to be planned in advance with the teacher so please schedule an appointment before going to the classroom. For the protection and safety of students, all visitors are required to check in at the school office and wear a visitor’s sticker. Students from another school or state are not allowed to visit classrooms or spend the day at school. Parents are welcome to join their child for lunch but recess time is reserved for student play so parents need to check out after lunch when their child goes to recess. In order to ensure our schools are safe and comfortable for all inhabitants, dogs are not allowed in the school, on school grounds or in the classroom unless they are serving as a bona-fide service dog to a staff member, parent, child or visitor. This means that dogs or other animals should not be on their leash in the front of our school at the beginning or end of the day. Please don’t bring your dog in your arms as children love to pet them and we don’t want to have any bites or scratches. 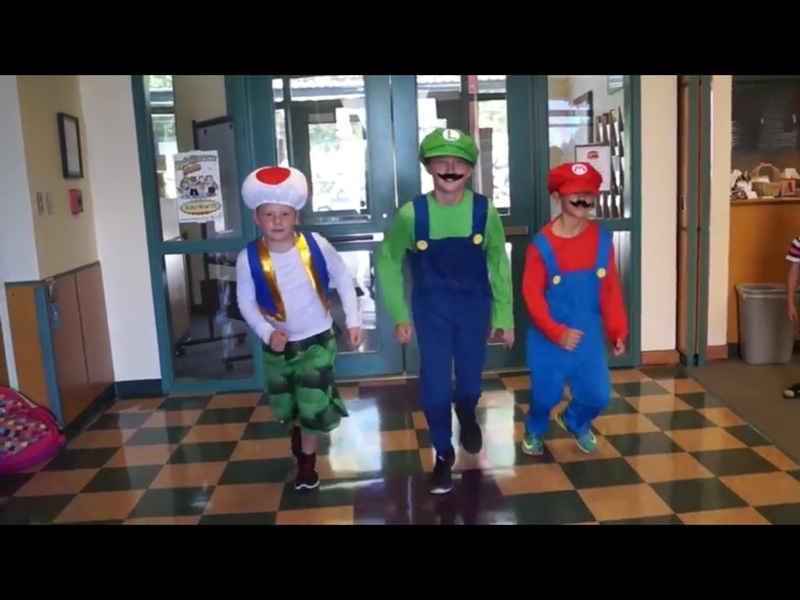 Lakeview’s PTSA’s ‘Stache Dash Jog-a-thon 2015 is an all-school event scheduled for Wednesday, October 14th. This is our main fundraiser and ask families to make a generous donation. It pays for programs like science enrichment, art docent program, IXL and Reflex math enrichment, classroom materials, teacher appreciation, and field trip grants, not to mention events like the Science Fair and Family Dance Night. In addition, this year we need to fund our new PE Equipment and new Netbook computers. Our PTSA provides numerous opportunities for our children that would not otherwise be funded by the state or district budgets. Tara & Kara "Book tasting"
Parents interested in learning more about programs for highly capable students and the application process are strongly encouraged to attend the Quest Parent Information Night on Thursday, October 1, at 4:30 p.m., repeated at 7 p.m., Performing Arts Center, Lake Washington High School, 12033 N.E. 80th St., Kirkland. Quest Parent Information Night is for parents of students currently enrolled in grades one through four. Parents only need to attend one of the two sessions and attendance is not required to apply. Research has found a correlation between early TV-watching and later bullying behavior. This occurs even with non-violent content, where children may witness antisocial behavior, such as characters being disrespectful. This is not the case with shows such as Sesame Street or Mister Rogers’ Neighborhood, whose messages about cooperation, nurturing, and verbalizing feelings have been shown to increase children’s likelihood of demonstrating those skills.